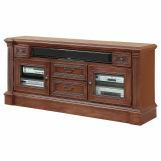 Add traditional appeal and make a statement in your entertainment space with this four piece entertainment wall. Antique-styled hardware adorns the vintage umber finish of this piece which also features carved detailing and moulded door and drawers fronts. 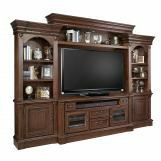 Four drawers and four doors offer plenty of space to stow media devices and other entertainment related items, while the pier cabinets and bridge provide great display space for some of your favorite photos and family mementos.